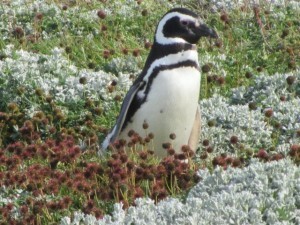 Punta Arenas is just a town. It has some lovely buildings in the main square but again it is the natural beauty that brings the travellers. It’s cold and bleak but that is to be expected as we head further south. 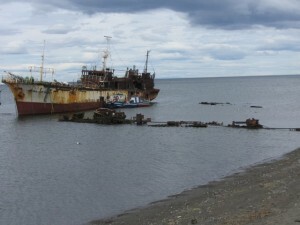 On the outskirts of town is a ships’ graveyard. We don’t know why the skeletal wrecks are here but they make for some interesting photos. 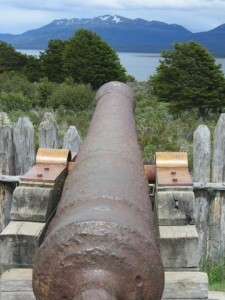 When Chile took the Magellan Straits and Tierra del Fuego in the 1840s they built a fort on the cliffs overlooking the straits – Fuerte Bulnes. It’s at the end of a dirt road, about 70ks out of town. It’s bloody windy again and the bike is getting blown around on the road. At the gate we pay a small entrance fee and ride down another dirt road. At the end of it is the Fort. It’s a harsh but beautiful landscape. 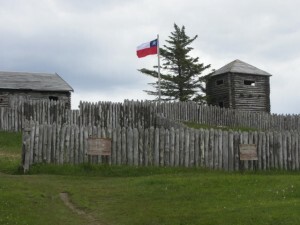 Restored in the 1980s the Fort is built from logs and bricks that seem to be made from peat. They note on the signs that the fort was designed to stop the likes of the pirates and buccaneers who plied their wicked ways through these waters centuries before. One mentioned by name is Sir Francis Drake. They seem to have not forgotten his dealings with the Spanish Armada! There are cannons trained on the waters on both sides of the fort and even a small church. The gun powder bunker is still there and massive, handmade gates to keep the soldiers in or the natives out. In the little shop there is a toy Milodon – a friend for Ken! Meet Millie on Ken’s latest blog. 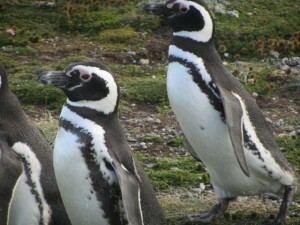 On the other side of Punta Arenas is the Seno Otway pinguinera…home to about 14,000 Magellan penguins from September to March. Unlike our fairy penguins in Phillip Island who go to see at dawn and come back at dusk these penguins go to sea for eight hours at a stretch at any time of the day. It is light here before 5.00 am and it doesn’t get dark until well after 10 pm so dawn to dusk would be arduous! 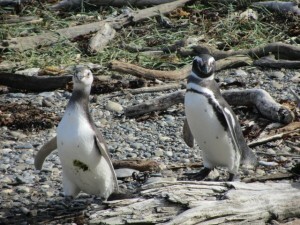 These amazing little birds waddle up the beach and through the tracks to their burrows. They sun themselves in the grasses before heading below ground. The path takes you very close to the birds and their homes. One is nesting right alongside the pathway and doesn’t look at all comfortable with the feet walking by. 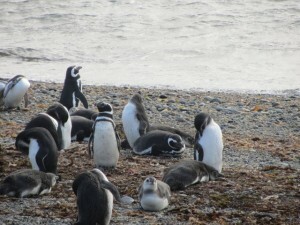 A hide on the edge of the sand lets us watch as at least 100 penguins as they sit by the water, preening or just resting after their time fishing. This is just a taste for what is to come in Antarctica. 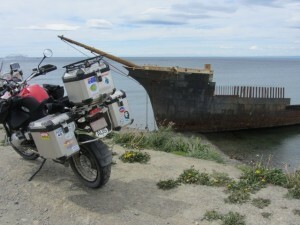 Two days of riding and we’ll be in Ushuaia – the end of the world. 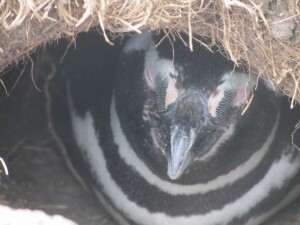 From there we take our trip to the Antarctic continent. Hi Brian & Shirley, Reg here from Apollo Bay. Saw Gav & Nicky this morning Nicky was selling ‘doggy treats’ at the market. They told Maiva & I of your huge adventure. Have read Shirleys story so far –awsome. You are both very game! Good luck going to Antarctica Hope you’re not trying to ride the GS there.